The United States Congress designated the Washakie Wilderness (map) in 1964 and it now has a total of 693,933 acres. All of this wilderness is located in Wyoming and is managed by the Forest Service. 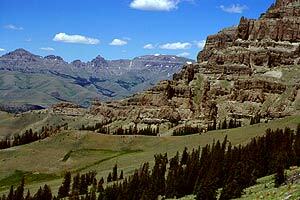 The Washakie Wilderness is bordered by the Teton Wilderness to the west. Chief Washakie was a historical figure and leader of the Shoshone tribe of Wyoming. In 1972, the Stratified Primitive Area was joined with South Absaroka Wilderness to form the Wilderness area (Wyoming's largest) that now bears his name. Yellowstone National Park borders to the northwest, Teton Wilderness to the west, and the Wind River Indian Reservation to the southeast--a combination of lands that stretches across a tremendous part of western Wyoming and is one of the greatest wild regions of America. In the southern Absarokas you'll find broad, flat-topped mountains and plateaus separating narrow valleys that have been deeply incised with exposed volcanic strata. This volcanic material lies primarily horizontal and has been eroded into irregular step-like cliffs and buttes. These unique geological formations, in addition to petrified forests and many fossils of long-gone plants and animals, are among the most attractive attributes of this area. Elevations range from about 6,600 feet to 13,153 feet, and peaks exceeding 12,000 feet are scattered throughout the Wilderness. Large portions are rough and barren, and vegetation is sparse. Approximately half the area is forested. With fewer lakes than the Wind River Mountains, the fishing is less active here, but large streams do support trout. Nonetheless, the wildlife population and diversity is extraordinary. Bobcats, coyotes, foxes, beavers, and numerous smaller furbearers, as well as bald eagles and peregrine falcons, can be spotted. Lucky visitors may see bull elk sparring or catch a glimpse of a moose. Hunters come for elk, moose, bighorn sheep, mule deer, and black bears. Grizzly bears, wolves and mountain lions are numerous and on the increase. Travelers should take appropriate precautions. There are many miles of trails and the relative openness of much of the area encourages off-trail hiking. Snow may fall any day of the year in the higher country, and summer temperatures rarely rise above 80 degrees Fahrenheit. Be prepared for rain showers in late summer. Planning to Visit the Washakie Wilderness? How to follow the seven standard Leave No Trace principles differs in different parts of the country (desert vs. Rocky Mountains). Click on any of the principles listed below to learn more about how they apply in the Washakie Wilderness.